Recently I visited family in Massachusetts and we stopped by the Marshfield Hills General Store which is now owned by actor and comedian, Steve Carrell. In a Boston Globe interview Steve, a native of Massachusetts, explained that he saw this as an opportunity to preserve a little piece of history. He felt that the gathering places of general stores give people a sense of community. The Carrells have owned the store since 2009. I remember going to this store in the early 60’s with my friend who lived nearby. She and I rode horses, stopped and tied them outside on a post, and entered the store for a snack. When I visited the store with my parents last week, it was a snowy afternoon filled with memories of the town where my father was once a high school science teacher. How wonderful that Steve Carrell appreciates the importance of preserving this general store! 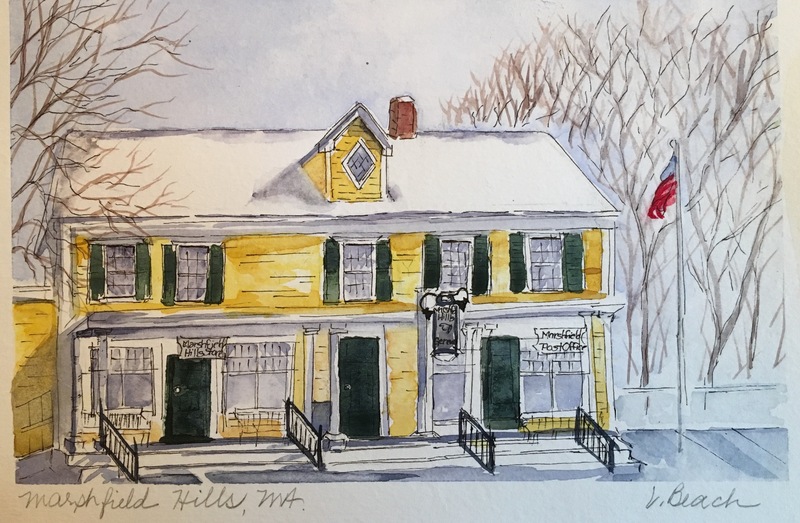 The Marshfield Hills General Store and Post Office is located at 165 Prospect Street in the Marshfield Hills Historic District. Technical notes: Studio sketch from a photo of the Georgian Colonial General Store in a Stillman & Birn Beta Sketchbook, Micron pen and Watercolors by Winsor Newton and Daniel Smith.